Police investigating a fatal road traffic collision in Leeds and have released CCTV images of two potential witnesses they would like to trace. Stephen James Linley, aged 33, from Leeds, died at the scene of the collision, which occurred in Black Bull Street near the junction with Armouries Way at about 9.40pm on Friday 12 October 2018. Detectives in West Yorkshire Police’s Major Collision Enquiry Team are now releasing two CCTV images of potential witnesses to the collision and are appealing for those pictured, or anyone who recognises those pictured, to get in contact with police. 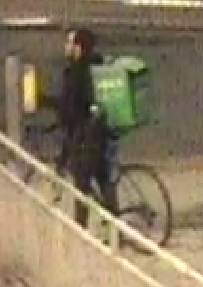 One of the potential witnesses is an Uber Eats delivery rider. “Writing a tribute for anyone who you love who has gone is difficult. Writing a tribute for Steve, who was so young and taken from us so suddenly, is unbearable.